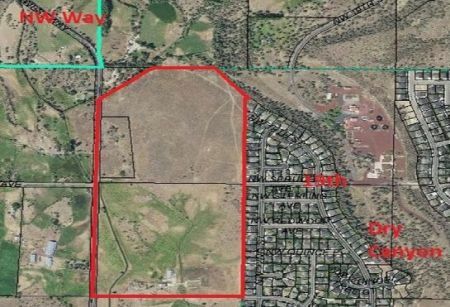 REDMOND, OR -- Redmond City Councilors are expected to approve a resolution on Tuesday, annexing 77 acres near Northwest Way and NW Spruce Avenue into the city limits. City Planning Manager Deborah McMahon says a developer plans a large housing project, with over 500 residential units, "This property is already within the UGB. The goal is to pull it into the city, give it urban zoning, then allow it to be developed with a new park and new residential opportunities, which include senior housing on 40 acres and then mixed housing on the northern portion of the property." That senior housing will be restricted to residents 55 and older. She tells KBND News, "When we did the Urban Growth Boundary expansion, back in 2007, this was land that was in close proximity to existing city services and so it was first priority for development." McMahon says when the Sahhali Village Master Plan was approved by Councilors last fall, the city made a unique request: "Provide 30 Accessory Dwelling Unites, or 'ADUs,' on the property in conjunction with housing development. So, where these ADUs will be placed they’ll be developed at the same time, with the same design, as the primary home. That is a novel approach to getting a little more affordable housing every time we get a new development." The project also includes multi-family housing, duplex lots and townhomes. McMahon says if things go smoothly, construction could begin in the next year.